Achingly adorable, surprisingly spacious, light-filled Craftsman perched on a brilliant West facing corner makes this home a real treat! Coveted circular floor plan for easy living and entertaining. 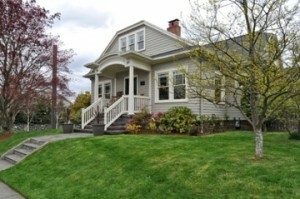 Large living and din rms, glistening hdwd/fir flrs, eating nook, fp, orig built-ins, flex spaces incl rec rm and office. Sensational rooftop deck, ideal entertaining patio and attached garage. Just a few blks to schools, parks/community center and everything we love, incl local Farmer’s Market.